Two Loves and a Life by Tom Taylor and Charles Reade. Scene: Bardsea Hole by moonlight. ADELPHI THEATRE.--"TWO LOVES AND A LIFE." Messrs. Reade and Taylor's meritorious drama, thus entitled, continues to be attractive and fully justifies the commendations which have been bestowed upon it. It is desirable to encourage literary merit in productions for the stage and particularly where, as at the Adelphi, much account is made of certain theatrical effects. Far are we from undervaluing these, for well we know taught both by precept and experience that unless the proprieties of the stage are observed the best writing may prove inoperative. Melodrama is the skeleton of a play, to which poetical or literary ornamentation is as the flesh and the blood charming both by its texture and its tinct. Too frequently the ordinary audience of a theatre has been satisfied with the bony spectre and been terrified and agitated with its ghastly doings, by which such audience has heretofore, at any rate, been strongly moved and excited though the cultivated taste has been outraged. The general enlightenment of the people is now no longer content with such meagre stage exhibitions, and hence the most popular of theatres is becoming every day more classical in its entertainments. The scenery and appointments, at the same time, judiciously receive the same attention as ever, as may be witnessed by the illustration herewith presented. 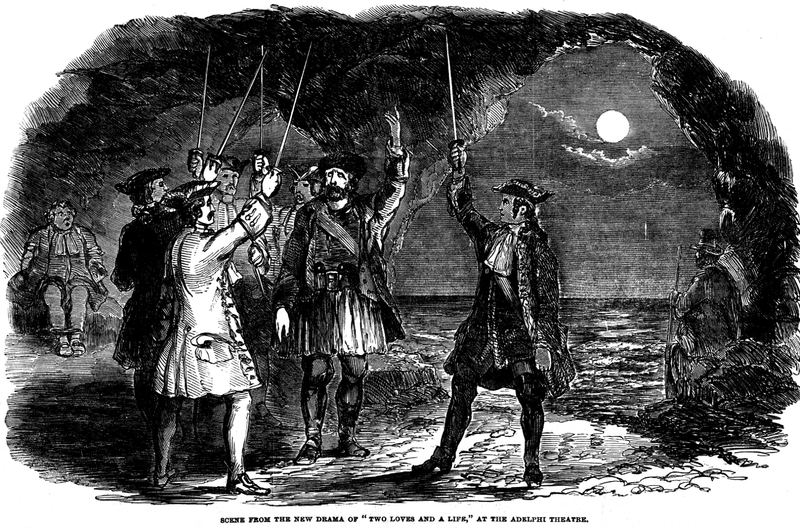 The scene is that of Bardsea Hole by moonlight—the rendezvous for the Jacobite conspirators, whither the poor schoolmaster John Daw (Mr. Keeley) is compelled to journey by Father Radcliffe (Mr. Webster) much against the grain, in dread of the pistol which he believes to be levelled at his head behind. Here the gentlemen of the northern counties consult as to the best means of promoting the Pretender's claims and renew their oaths of fidelity to his cause. But all is in vain. The troops of the Duke of Cumberland are upon their track, and they are taken in the snare. Like the other incidents of this drama, there is not much novelty in the situation just described. The merit in this, and the other instances, lies in the skill with which the interest is prepared for and elaborated. The whole serves to show how successfully genius or talent may deal with old materials giving new life even to the obsolete and stamping its peculiar impress on the outworn details of traditional stage-craft, thereby making its own what must otherwise have passed into oblivion as either dull or dead. Thus re-animated, these ancient sources of interest again rightfully challenge public attention and command a legitimate success. An occasional piece, entitled "The Moustache Movement," was produced on Thursday. There is no attempt at plot, but the movement alluded to is caricatured by presenting a butcher, a baker, a waiter, and a lawyer's clerk, with the specified ornament on the upper lip. The last-named worthy is personated by Mr. Keeley, and wins the heart of a milliner by wearing a false moustache. This, by a series of mistakes and escapades, he is at last compelled to confess, and divests his lip of the appendage, which he surrenders into the hands of Mrs. Kelley, who, thereupon, addresses the audience in a parody of Rosalind's epilogue to Shakspeare's [sic] "As You Like It," in favour of whiskers and beards. The whole thing is the veriest trifle; but, by the aid of good acting, sufficed to please the pit--which, indeed, seemed to be exceedingly amused.